When the Museum of the City of New York posted its 1921 picture of the Flushing King Neptune Fountain in little Flushing Park earlier this month, it demonstrated once again how beautiful this fountain was. Sitting on the island of Northern Boulevard near where it meets Main Street meet, it was no doubt a refreshing sight for travelers passing by and enjoyable place to rest or cool off. While still heavily traveled today, the intersection was much more significant in terms of travel options in1874 when the fountain was first erected. Broadway and Main might have been the most important intersection in all of Queens at the time. In 1874 it was almost impossible to get to northern Long Island and not pass through here. There was no Long Island Expressway south of it, no Whitestone Expressway west of it. There was no Northern State Parkway until 1934, no Motor Parkway until 1908. Perhaps the best route from Manhattan to much of Long Island was through Flushing and past the fountain that greeted them. Flushing and its island could have been arguably been considered the gateway to Long Island. 1907 Map of eastern Queens – Broadway is one of 4 roads leading east out of Queens. Despite being the centerpiece of the park in Flushing, it was somehow allowed to deteriorate in the 1940’s and was removed by the parks department in 1947. It had been thought the fountain was removed due to the widening of Northern Boulevard in the late 1930’s, but that is not the case. The photo below shows the fountain still standing after the new road design was put in place. 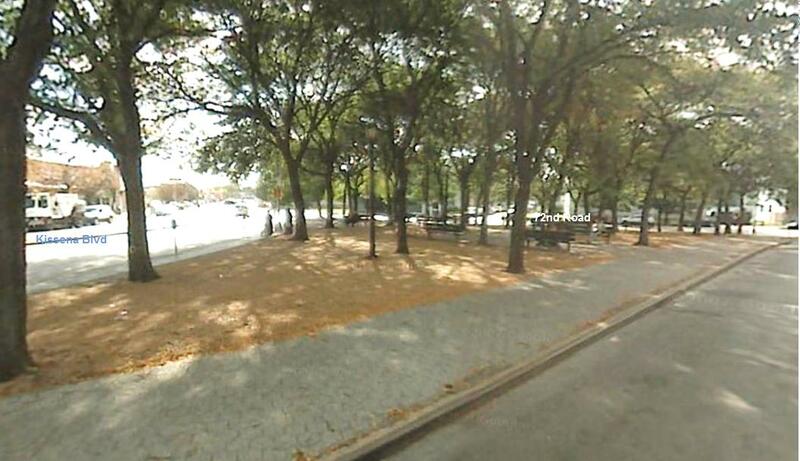 The April 18th 1971 New York Times describes a walking tour given by young aspiring historian Abe Wolfson who explains it was the parks department who neglected and then removed the fountain in 1947 after standing for about 100 years. (It actually stood for roughly 73 years but who’s counting). Exactly why the parks department would have removed the fountain is speculative. Nevertheless it raises some of the same old questions about its famous commissioner Robert Moses. It’s not the first time Moses has been known to exhibit less than extreme care with respect to the preservation of invaluable historic landmarks (e.g. the Battery Park Aquarium, the Central Park Casino, the Columbia Yacht Club, etc.). Why the parks department didn’t maintain it is perplexing, why they didn’t restore it is disturbing. During the same period of time, from 1946 to 1949, the parks department implemented a vigorous post war restoration initiative, spending $22.5 million on the reconstruction of older parks.1 Why couldn’t the fountain be included? The answer may lie with Moses, when it came to projects like subways and railroads, Moses would habitually point out that they cost too much to build, when in truth he was really against them regardless of cost. While I haven’t found a press release from the parks department about why the fountain was pulled, I suspect if there is one it cites the high cost of restoring the fountain as the reason it was demolished. The real reason the fountain was not saved probably lies about a half mile to its west. From the start Moses was a staunch advocate of Flushing Meadow Park. He played a role in removing the infamous ash dump that polluted the park in the 1920’s and 30’s. He spent close to $60 million on improving it for the 1939-1940 worlds fair. It was Moses’ kind of park, lots of open land, very neat and clean, lots of parkways and expressways leading to it. To Moses the old fountain was probably messy, old, cramped, and in the middle of an ancient outmoded downtown. He probably believed people would undoubtedly prefer to go to open Flushing Meadow instead of cramped Flushing Park, that it was better for them, that he was doing them a favor. Regardless of the cause, what a shame it is that such a valuable treasure is gone from a location that has endured such decline in light of the demise of the RKO theater just across the street. The fountain could have been a source of beauty in an intersection that has had so much of it taken away. Abe Wolfson was tragically killed six months after giving the walking tour described in the article . He is honored with the triangular park at Kissena Blvd and 72nd Road in his name. Wolfson was a flying enthusiast and on November 9th,1971 his single engine Cessna 150 crashed into a Montana farm fatally injuring him. Only 21, Wolfson had already founded the Queens Historical Society and worked on various clean up projects for the Flushing area. Had he lived he no doubt would have had a tremendous impact on Flushing and New York City. I am glad that I was able to learn about the history of the fountain from him nonetheless. Flushing Park along Northern Boulevard is a historical site. The city should allocate resources to restore the park along with the Neptune fountain. This would restore the character of the community. As the development efforts cpntinue along Main Street, perhaps the builders should be tequired to contribute to the restoration of the park?